EVERYBODY wants things to be free. No, it is definitely not things as deep as a free world, free speech and freedom to eat in public during Ramadan. It is of a much more base nature. People want to have things for free. Payment is a despised word. Well, there's a saying by someone who was probably a shopaholic, "nothing is free." Of course, advertisements will make you think otherwise. So who's right? 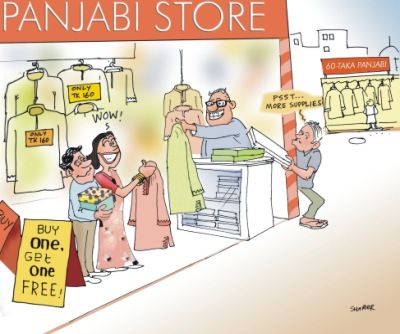 In business, the free offer is one of the most touted gimmicks and it is seeing a rising trend in Bangladesh. Ads are all bright and colorful with the promise of more for your money or rather more bang per buck. It's a lot like enticing a child to study with the promise of candies or other delectable goodies. Children hate studies but they will oblige for a treat. Similarly grownups hate taking out their wallet but may oblige for a similar goody. Seems fair, right? The trend has been copied (as usual) from the western society and their norms. Too bad it's not an exact copy. Mrs Shahrier traveled many countries over Europe as a result of her husband's occupation. Back in her homeland she noticed a nice change in the shopping scenario. Abroad most purchases were followed by coupons with discounts ranging from 10 to 30 percent off of the price. These could be collected and with enough points gathered, you could get a new item without dishing out money from your purse. Newspapers were rife with such coupons. Blame it on globalization. In the need to boost sales merchants here copy the tricks of merchants there. The difference is that in the lands far away you have to collect the coupons to choose an item you want. Here you are simply handed over an item whether you like it or not. This free offer is freely creeping into every facet of our lives. Starting from the kitchen, through the dining room via the bedroom and ending in the bathroom (in more ways than one) you will see influences of the free offers. Your food, tours, entertainment and even education has something linked to a free offer. You buy land or cement to build your home and even there you get such incentives. It's hard to pinpoint with what item and as to when the trend started. What can be said it that it is building up fast. It's making good use of the most important tool in marketing and that is publicity. The product is catching attention as well as getting sold. Anything from beverages and furniture, to home appliances, clothing and even airlines are offering incentives to attract the customers. Often you will be faced with scratch-cards that require long nails to uncover hidden, or in most cases, no treasure. Then there is the guaranteed win where empty packets returned get you a new filled packet. Soaps, milk and tea fall into this category. Then there is the beverage with riches just under the bottle cap. Cell phone operators offer free connection (although rarely). Entry tickets to amusement parks offer free food or rides. If you buy a plot of land you will be given a television and/or a video player presumably so you can sit back and enjoy in later years how you house grew up on a garbage landfill. Sounds too good? 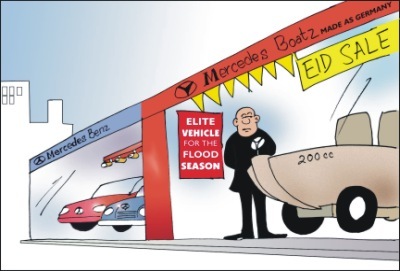 Major festivals like Eid are targeted with the major shopping stores offering cars and other attractive gifts. The Tangail Sari Kutir in Bailey Road was one of the first to start this trend by offering a set of matching bangles with each purchase. This payless wonder has reached to such an extent that even education could not escape its grasp. Some institutions offer the first few classes of a course for free. This trend has caught the imaginations of many in a spell. Soaps are bought three at a time so that the fourth is free of charge. Cooking items are bought with particular care so that something else can be had for nothing. Home appliances are bought after endless waiting in search of the perfect discount. In a way its helping many to archive what they wanted. Discounts take you one step closer to buying that expensive television you always wanted. Does anyone win in the end? So, is it all good? At times the mental rush at the thought of cut prices can obscure all signs of reason. What's the guarantee that all the free items are of good quality? In our country there is no governing agency capable of regulating the quality of materials. What's to stop the manufacturers from pushing the sub standard material into your hands? After all, nothing good is ever free.